Canoe rowing for less money: Package consists of 7' flat-blade oars, clamp-on oarpins, rowing outriggers, and a pair of outrigger sockets. Buy yourself a board locally (1 x 10 x width of your canoe plus a little bit more) and bolt the sockets to the board. Place board with sockets across gunwales, plug outriggers into sockets and clamp to gunwales with included clamps, sit on board, put oars in place and row! It's actually a very satisfactory canoe rowing solution and very quick to put on and take off your canoe. 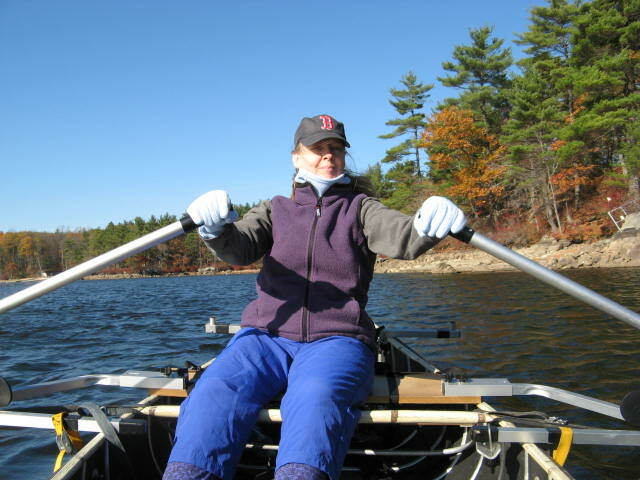 Picture: Click Here Socket is a double-tube socket, so you can also add stabilizer floats (item 1002 or item 1006) but then plan to secure board to canoe for times when you are not sitting on it -- get a pair of our gunwale clamps or devise other means. Optional lift blocks (item 5073) will increase clearance between knuckles and knees on the return stroke. Independent magazine review of this product CLICK HERE And for MORE ROWING PRODUCT INFO CLICK HERE.